Though prized as a beautiful ornamental tree by many gardeners, the Pohutukawa tree has also received negative attention for the damage its root system can cause to pipes and pavement. 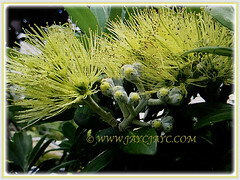 Botanical Name: Metrosideros excelsa (syn. : Metrosideros excelsus, Metrosideros tomentosa). 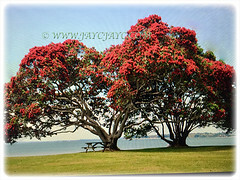 Common Names: New Zealand Pohutukawa, New Zealand Christmas Tree/Bush, Iron Tree. EtymologyThe genus name Metrosideros is derived from the Ancient Greek metra or iron. The specific epithet excelsa is from Latin excelsa meaning highest sublime. Origin: Native to New Zealand. Plant type: A beautiful flowering tree. 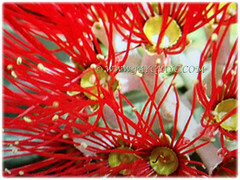 Features: Metrosideros excelsa is from the genus Metrosidero that consists of approximately 70 accepted species of trees and shrubs. It is slow-growing and reach up to 25 m tall, with up to a 35 m wide crown. It usually grows as a multi-trunked spreading tree. Its trunks and branches are sometimes festooned with matted and fibrous aerial roots. 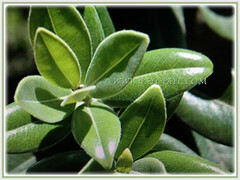 The oblong and leathery leaves, 4-7 cm long are covered in dense white hairs underneath. Leaf can be very rounded or bluntly pointed. 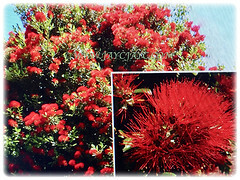 The tree flowers from November to January with a peak in mid to late December in the southern hemisphere summer with brilliant crimson flowers covering the tree, hence the nickname New Zealand Christmas tree. 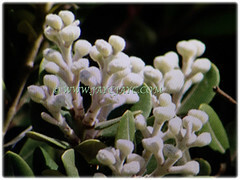 There is variation between individual trees in the timing of flowering, and in the shade and brightness of the flowers. Many of the trees growing around the Rotorua lakes produce pink-shaded flowers and the yellow-flowered cultivar ‘Aurea’ descends from a pair discovered in 1940 on Motiti Island in the Bay of Plenty. Its flower opens in the morning and petals fall in the afternoon. A free-flowering plant with red, pink and yellow flowers. 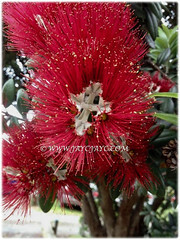 Culture (Care): Metrosideros excelsa or New Zealand Christmas Tree can be easily grown with least maintenance. Plant the tree far away from buildings and pipes because the roots have been known to cause severe damage to homes and foundations. Prune back any damaged or diseased branches as they appear and discard them to prevent the spread of disease to the rest of the tree. Prune back growth during the winter to shape the tree and give it a bushier appearance. Fertilize the tree by spreading a handful of bone meal and blood meal around the base of the tree in the spring. Generally free from serious garden pests and diseases. Nonetheless, do watch out for Trichosurus vulpecula browse that can seriously damage and even kill trees. 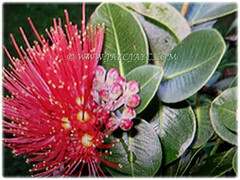 Metrosideros excelsa or New Zealand Christmas Tree is not fully hardy and recommended as a conservatory plant in frost prone areas. May survive a minimum temperature of 0°C. It is propagated from fresh seeds that should be direct sow after last frost. Propagation: Propagate easy from fresh seeds. Seeds must be sown fresh, even if left for a few weeks before sowing viability can drop, especially if seed is allowed to dry out.Very difficult from cuttings though soft wood water shoots give the best results. Can be grafted onto seedlings.